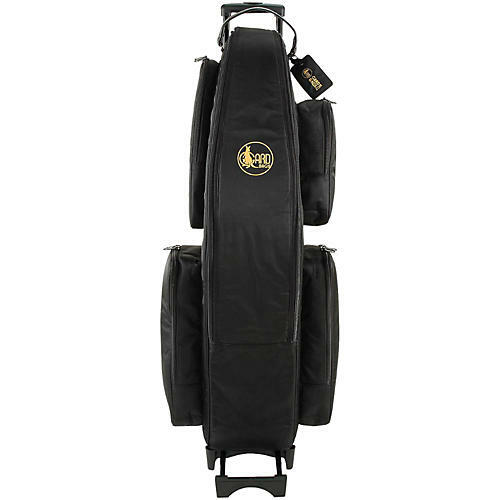 The Gard 107 WBFSK Low B Baritone Saxophone gig bag is made of stylish and durable synthetic leather. Heavy-duty wheels make transporting you horn easy. Comes in classic black. In ordinary bags, the delicate protruding parts of the musical instrument touch the bottom and sidewalls of the gig bag. In the event of an accidental impact the delicate protruding parts (1, 2 and 3) are liable to be damaged. In the mid bag suspension system, the music instrument is held by the more robust parts of the musical instrument (leaving the delicate parts suspended in mid air). This is done with flexible belts and a foam cone fixing the bell. (Patent applied for). As a result, 9 out of 10 times, the music instrument will escape damage when dropped. The instrument is "suspended" inside the gig bag to drastically reduce the chances of damage during impact. The belts and cone used for the suspension have velcro fastners and can be adjusted according to the instrument.